In the “old” demo garden, we had one raised bed that was our “Wheelchair Height Garden.” It was about 27 inches high, the height that was recommended for adults in wheelchairs. When we renovated the garden, it was important that we maintain one raised bed that was wheelchair accessible. I’m hoping to change the name to calling it our “accessible garden,” since the point is that it can be used by people with a variety of physical limitations. As we were designing it, we considered a number of things and this is what we ended up with. I don’t think this is the full size, although I could be wrong. 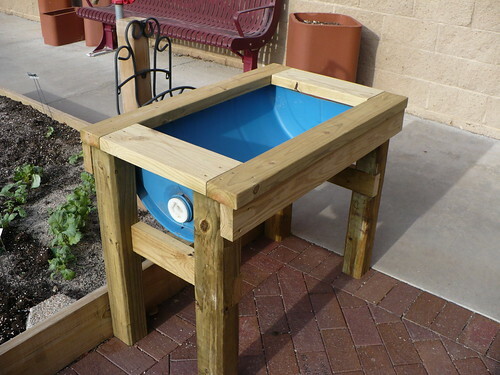 The half barrel in a frame is a pretty neat idea for a garden, and I’m interested to see how it works. 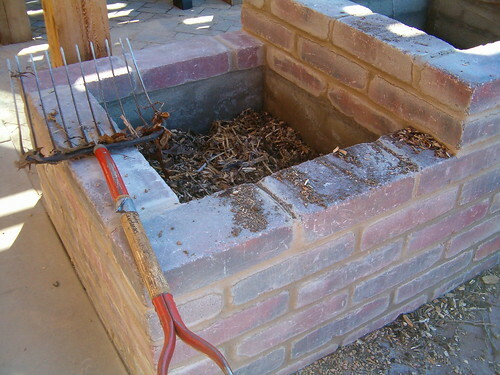 What I most like is that it provides more root depth in the middle, compared to a lot of the “table top” style gardens. 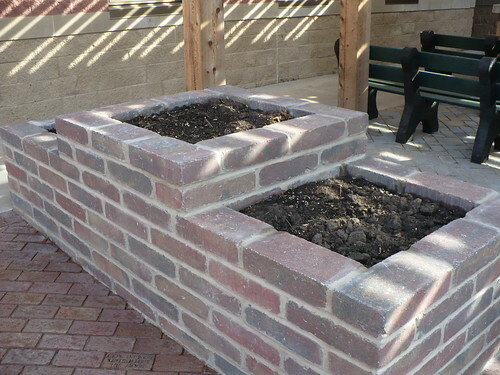 One of the questions we always get when we talk about filling raised beds that are taller is what to put in them? You can see here that we filled the bed about half to two-thirds full with cheap wood chips. The rest of the soil was then a mix of compost and topsoil. The woodchips will, of course, decompose with time, causing the soil level to settle. We counter that by adding fresh compost to the top every year. Our Horticulture Therapy committee is planning to make use of this new garden, so it won’t be part of our regular Demo Garden work. As with other projects going on, I’ll be sure to keep you updated when there is something of interest to share. We have never had a great spot for a shade garden on our grounds. Partly, we just don’t have a truly shady area. 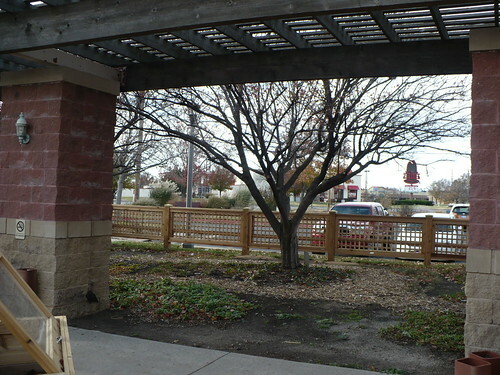 The area with two maple trees right outside the Demo Garden that faces northwest is about as close as we come. In order to keep wind protection and provide some boundaries, we removed part of the lattice on that end of the garden and built a fence around the outside of the “new” garden boundary. You can see the new fence, one of the existing maple trees, and the new open area between the two pillars. We already had some groundcovers and a mulched path from a groundcover trial we were doing. 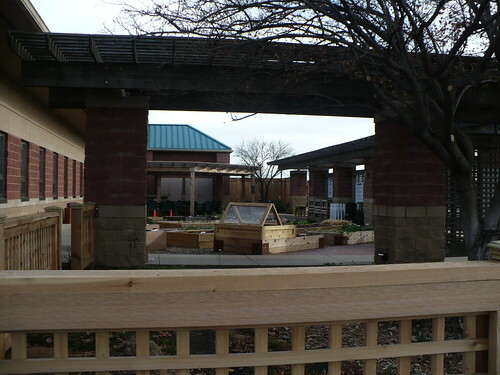 They are currently planning the new layout for this garden area and will be planting in 2013. I probably won’t cover this garden in the same detail that I cover the vegetables and herbs, but we’ll definitely take a spin through it every so often. It also gives a nice view into the garden with that lattice removed. I hope it doesn’t cause a wind problem. I have 3 “new” things to share with you this week, which are really just miscellaneous items that we haven’t covered from the ongoing garden renovation projects. Then there will be a hiatus while I’m traveling for Christmas, and we’ll be back in January to start out planning the garden for 2013! 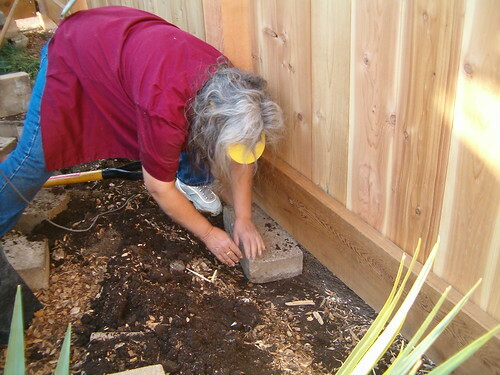 When we were working on the garden renovation this spring, we realized that the fence around the “Quiet Garden” area had posts that were rotted off at the ground level. So that fence got replaced in early September. Because we sometimes have had issues with soil washing out under the fence, we put some extra block from the old garden under the fence to help hold the soil in better. In the corner of the quiet garden, next to the shed door, we installed 2 rain barrels. 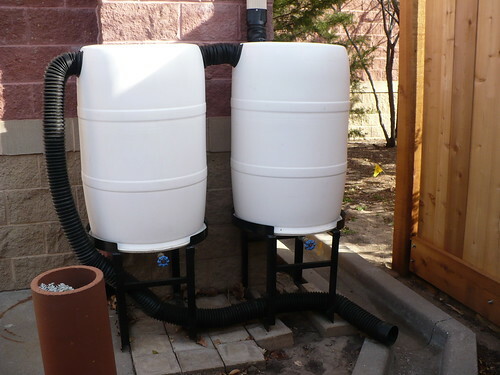 Rain barrels had been on the to-do list for quite some time. You can see we have the first barrel attached to the guttering and connected to the second barrel. The second barrel also has an “overflow” pipe that will go into the usual drain. I should go check and see how much water we collected from the small rain we had a few days ago! 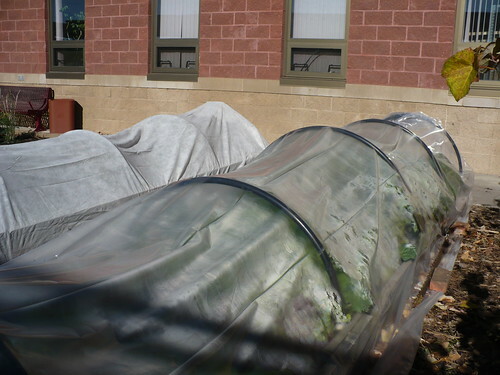 This is what we’ve done in the past – putting either plastic or fabric over low plastic hoops to protect cool season vegetables. 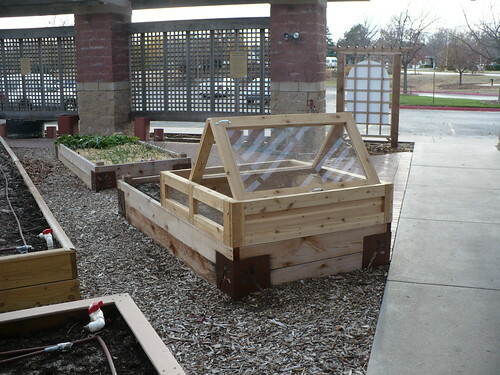 With the new garden, we wanted to try something new, especially something that wouldn’t be as susceptible to the wind! 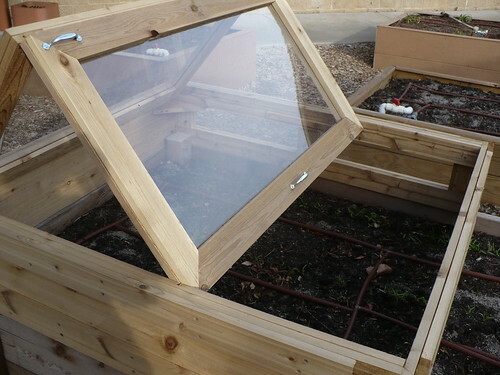 We wanted to try a more traditional cold frame, which is a wooden box with a glass/plastic top. We used plexiglass. One of our Master Gardeners built this for us. (Thank you, Don!) 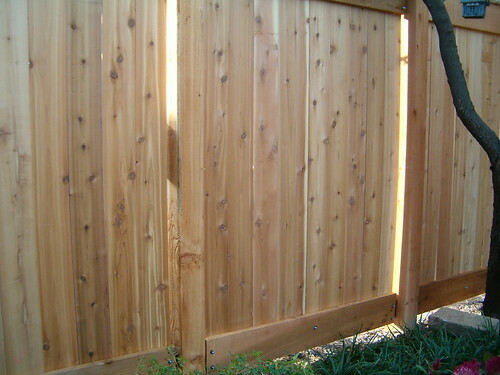 It is designed to fit onto the red cedar raised beds, around the corner posts. As you can see, the lid is hinged and runs on a track. It is also only about 4′ x 4′ rather than the length of the whole bed. We wanted something that would be usable but that we could still hope to lift and store somewhere during the rest of the year! 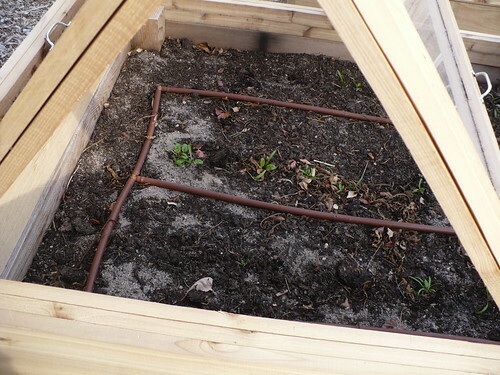 The Master Gardeners planted some spinach seeds in this raised bed the week before the cold frame was installed. They are growing pretty well, since the weather has still been warm. The day length tends to slow the growth down at this time of year as well. You can see we still have the lid open, since it hasn’t been getting consistently cold. I might see about closing it for today and tomorrow, then opening it again later in the week. Just in case you are missing all of the posts about our garden renovation project (I’m not! ), or if you missed seeing part of the process unfold, here is a list of all the posts from the past 6+ months about our renovation. There you have it! Not counting the demolition, that covers 2 1/2 months of garden renovation. Actual days where work was being done looks to total up to about 34 or so. Yikes!